Reading and share top 22 famous quotes and sayings about Copernic by famous authors and people. 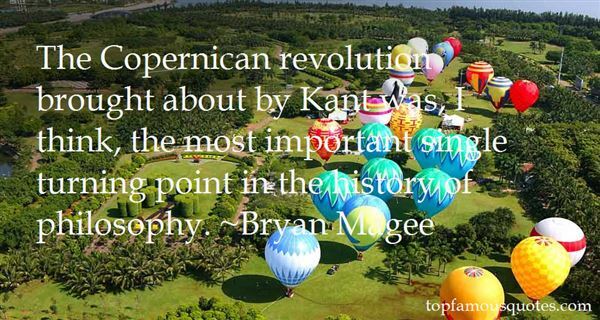 Browse top 22 famous quotes and sayings about Copernic by most favorite authors. 1. "The Copernican revolution brought about by Kant was, I think, the most important single turning point in the history of philosophy." 2. "- Brilhante discurso - comentou Martín.- Histórico. Cada vez que esse homem fala, a história do pensamento no ocidente realiza uma revolução copernicana." 3. "I am a collector of notes upon subjects that have diversity — such as deviations from concentricity in the lunar crater Copernicus, and a sudden appearance of purple Englishmen — stationary meteor-radiants, and a reported growth of hair on the bald head of a mummy — and 'Did the girl swallow the octopus?" 4. "The Christians who engaged in infamous persecutions and shameful inquisitions were not evil men but misguided men. The churchmen who felt they had an edict from God to withstand the progress of science, whether in the form of a Copernican revolution or a Darwinian theory of natural selection, were not mischievous men but misinformed men." 5. "After the birth of printing books became widespread. Hence everyone throughout Europe devoted himself to the study of literature... Every year, especially since 1563, the number of writings published in every field is greater than all those produced in the past thousand years. The Paracelsians have created medicine anew and the Copernicans have created astronomy anew. I really believe that at last the world is alive, indeed seething, and that the stimuli of these remarkable conjunctions did not act in vain." 6. "A man that is of Copernicus' Opinion, that this Earth of ours is a Planet, carry'd round and enlightn'd by the Sun, like the rest of them, cannot but sometimes have a fancy … that the rest of the Planets have their Dress and Furniture, nay and their Inhabitants too as well as this Earth of ours.… But we were always apt to conclude, that 'twas in vain to enquire after what Nature had been pleased to do there, seeing there was no likelihood of ever coming to an end of the Enquiry … but a while ago, thinking somewhat seriously on this matter (not that I count my self quicker sighted than those great Men [of the past], but that I had the happiness to live after most of them) me thoughts the Enquiry was not so impracticable nor the way so stopt up with Difficulties, but that there was very good room left for probable Conjectures." 7. "She has to lose her pre-Copernican view of a universe revolving around herself." 8. "I was accused of being against civilization, against science, against humanity. naturally, i was flattered and at the same time surprised, hurt, a little shocked. he repeated the charge. but how, i replied, being myself a member of humanity (albeit involuntarily, without prior consultation), could i be against humanity without being against myself, whom i love - though not very much; how can i be against science, when i gratefully admire, as much as i can, thales, democritus, aristarchus, faustus, paracelsus, copernicus, galiley, kepler, newton, darwin and einstien; and finally, how could i be against civilization when all which i most willingly defend and venerate - including the love of wilderness - is comprehended by the term"
9. "The full impact of the Lobachevskian method of challenging axioms has probably yet to be felt. 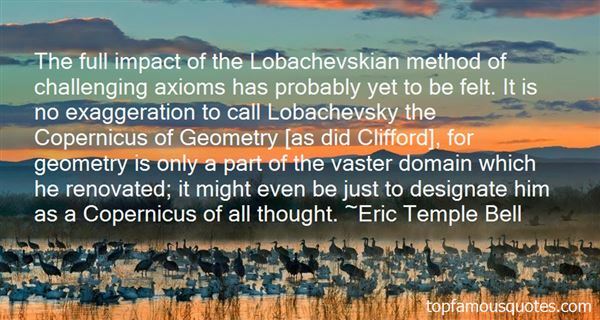 It is no exaggeration to call Lobachevsky the Copernicus of Geometry [as did Clifford], for geometry is only a part of the vaster domain which he renovated; it might even be just to designate him as a Copernicus of all thought." 10. "After a duration of a thousand years, the power of astrology broke down when, with Copernicus, Kepler, and Galileo, the progress of astronomy overthrew the false hypothesis upon which the entire structure rested, namely the geocentric system of the universe. The fact that the earth revolves in space intervened to upset the complicated play of planetary influences, and the silent stars, related to the unfathomable depths of the sky, no longer made their prophetic voices audible to mankind. Celestial mechanics and spectrum analysis finally robbed them of their mysterious prestige." 11. "I am not very impressed with theological arguments whatever they may be used to support. Such arguments have often been found unsatisfactory in the past. In the time of Galileo it was argued that the texts, 'And the sun stood still... and hasted not to go down about a whole day' (Joshua x. 13) and 'He laid the foundations of the earth, that it should not move at any time' (Psalm cv. 5) were an adequate refutation of the Copernican theory." 12. "It has often been noted that three major revolutions in thought have threatened the idea of human centrality. First, Copernicus demonstrated that Earth was not the center about which all celestial bodies revolved. Next, Darwin showed us that we were not central in the chain of life but, like all other creatures, had evolved from other life-forms. Third, Freud demonstrated that we are not masters in our own house-that much of our behavior is governed by forced outside of our consciousness. There is no doubt that Freud's unacknowledged co-revolutionary was Arthur Schopenhauer, who, long before Freud's birth, had posited that we are governed by deep biological forced and then delude ourselves into thinking that we consciously choose our activities." 13. "I live on the other side of Copernicus and Galileo; I can no longer conceive of God as sort of above the sky, looking down and keeping record books." 14. "[Patty's] Copernican wish to the be sun around which all things revolved"
15. "There is talk of a new astrologer [Nicolaus Copernicus] who wants to prove that the earth moves and goes around instead of the sky, the sun, the moon, just as if somebody were moving in a carriage or ship might hold that he was sitting still and at rest while the earth and the trees walked and moved. But that is how things are nowadays: when a man wishes to be clever he must . . . invent something special, and the way he does it must needs be the best! The fool wants to turn the whole art of astronomy upside-down. However, as Holy Scripture tells us, so did Joshua bid the sun to stand still and not the earth. [Martin Luther stating his objection to heliocentrism due to his Scripture's geocentrism]"
16. 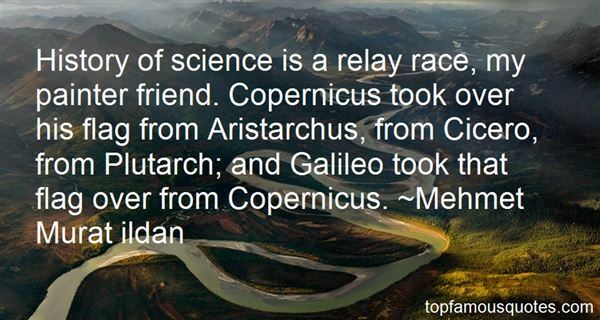 "History of science is a relay race, my painter friend. Copernicus took over his flag from Aristarchus, from Cicero, from Plutarch; and Galileo took that flag over from Copernicus." 17. "It was the merit of Gestalt psychology to make us aware of the remarkable performance involved in perceiving shapes. Take, for example, a ball or an egg: we can see their shapes at a glance. Yet suppose that instead of the impression made on our eye by an aggregate of white points forming the surface of an egg, we were presented with another, logically equivalent, presentation of these points as given by a list of their spatial co-ordinate values. It would take years of labour to discover the shape inherent in this aggregate of figures - provided it could be guessed at all. The perception of the egg from the list of co-ordinate values would, in fact, be a feat rather similar in nature and measure of intellectual achievement to the discovery of the Copernican system." 18. "Long ago it took a Copernicus to tell a provincial world that this planet was not the center of the universe. Some selfish moderns need a Copernican reminder that they are not the center of the universe either!" 19. "While the Copernican principle comes with no guarantees that it will forever guide us to cosmic truths, it's worked quite well so far: not only is Earth not in the center of the solar system, but the solar system is not in the center of the Milky Way galaxy, the Milky Way galaxy is not in the center of the universe, and it may come to pass that our universe is just one of many that comprise a multiverse. And in case you're one of those people who thinks that the edge may be a special place, we are not at the edge of anything either." 20. "It was not just the Church that resisted the heliocentrism of Copernicus." 21. "The world is kept alive only by heretics: the heretic Christ, the heretic Copernicus, the heretic Tolstoy. Our symbol of faith is heresy. ("Tomorrow")"
22. "I esteem myself happy to have as great an ally as you in my search for truth. I will read your work ... all the more willingly because I have for many years been a partisan of the Copernican view because it reveals to me the causes of many natural phenomena that are entirely incomprehensible in the light of the generally accepted hypothesis. To refute the latter I have collected many proofs, but I do not publish them, because I am deterred by the fate of our teacher Copernicus who, although he had won immortal fame with a few, was ridiculed and condemned by countless people (for very great is the number of the stupid)." He worked night and day. He made a coat that would transform him; he would be more than a man; a winged creature, beautiful as light. All the birds brought him feathers. Even the eagle. Even the swan."